A blue and pink potion have arrived in the Black Market! What could they possibly do? Wow I was SO EXCITED about this so I ran right to the BM to buy the potion for my new blue dragon -- and I saw my multicolored dragon on my scroll? Blue potion only turns females into males! Red potion only turns males into females! You cannot buy a second potion until you use the first one! Just when I started to worry because mu otterbear gendered wrong. Thank you Reb! The timing was perfect. I bought one out of curiosity. Haven't used it yet but glad to know what it does. Especially useful if the Quest Sea Serpant I bought in market turns out female I can change gender and get a breeding pair. Mineya wrote: Wow I was SO EXCITED about this so I ran right to the BM to buy the potion for my new blue dragon -- and I saw my multicolored dragon on my scroll? So...your saying that if you buy a potion meant for a male and you use it on a female then the creature will turn multicolored? Or...what? The pirates told me that the increase of demand is going to make the potions more expensive soon!!! The potions had nothing to do with the multicolored dragon, I just went to use them and it was there. It's the same one that's in my signature, which I colored myself over the base that Little Art Girl made (with permission, of course). O_o Maybe it's a gift? But that's one cool dragon xD Yay for gender potions! That's a cool dragon you have there. More expensive? Ouch that may hurt our pockets a bit. Thank you so much for doing this! I remember how frustrated I got trying to get pairs (sorry about that, guys; I know it wasn't your fault, it was chance) but this makes it marvelous. Especially when you want to breed creatures (which I love to do, if only they would!) as badly as I do. I just turned one of my 3 female red dragons into a male. (I hope this doesn't blow the poor dear's mind). Rebs, don't forget to make it so you can't change your koi fish/Spirit koi's gender. i'm glad to have this option, but ouch those are expensive. 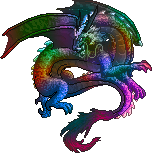 this is so cool, although i got more intrest in that multicolored dragon when i read about it. I bought one of these in hopes that it would turn my ungendered dragons and bison into one with gender, but no such luck. I've PM'd Reb awhile ago, trying to get them to be gendered (as they grew up genderless and have not yet been fixed). If this doesn't work can you please either fix the problem or make it so I can buy my dragonsXskybison a gender. Please. I really want to breed the dragons. I don't care so much about the bison, but the dragons at least. Please.